In order to upload code to the ESP8266 and use the serial console, you will need a USB to serial converter! Use either an FTDI cable or any console cable, you can use either 3V or 5V logic and power as there is level shifting on the RX pin. Don't forget to visit esp8266.com for the latest and greatest in ESP8266 news, software and gossip! PL2303 USB console cables seem to only work with Windows computers for some reason. 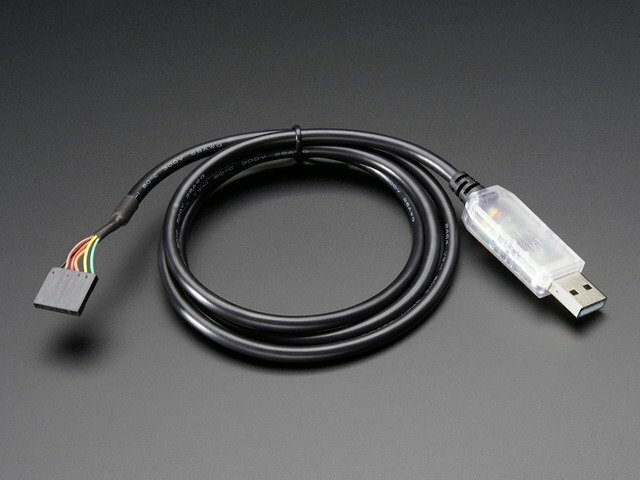 Mac users, we suggest FTDI cables! 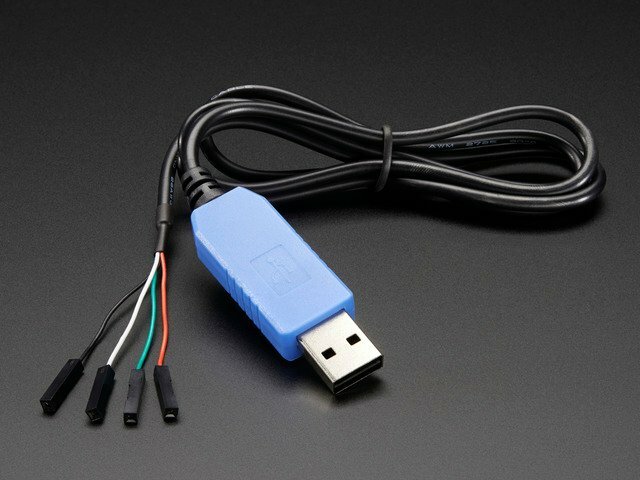 The ESP8266 uses a lot of current, so if you're getting flakey behavior make sure you are plugging your console cable into either a motherboard USB port or a powered USB hub. Don't use the 'extra' USB port on your monitor or keyboard. You will see the red and blue onboard LED flicker when powered up, but they will not stay lit. Enter http://arduino.esp8266.com/stable/package_esp8266com_index.json into Additional Board Manager URLs field in the Arduino v1.6.4+ preferences. Visit our guide for how to add new boards to the Arduino 1.6.4+ IDE for more info about adding third party boards. Next, use the Board manager to install the ESP8266 package. 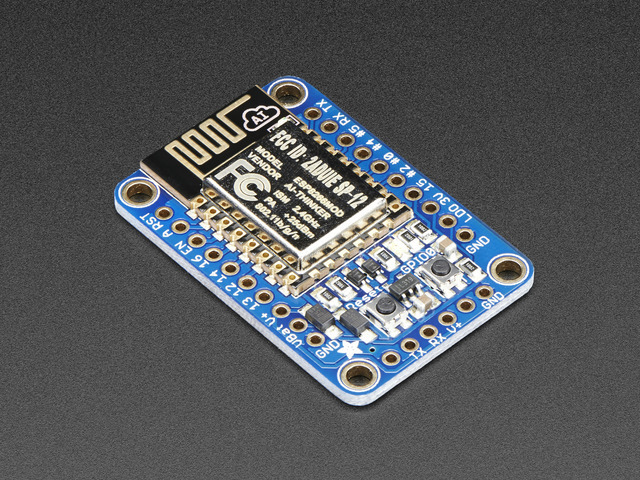 When you've restarted, select Adafruit Feather HUZZAH ESP8266 from the Tools->Board dropdown. Note that even though this is a Huzzah breakout, its the same 'definition' file as the Feather so just use that! 115200 baud upload speed is a good place to start - later on you can try higher speeds but 115200 is a good safe place to start. You can move down to lower speeds if you are having upload issues, or speed it up if your setup is stable, for faster uploads! You don't have to set Programmer because it will always use the serial port, just ignore that menu item! Now you'll need to put the board into bootload mode. You'll have to do this before each upload. There is no timeout for bootload mode, so you don't have to rush! The sketch will start immediately - you'll see the LED blinking. Hooray! Open up the IDE serial console at 115200 baud to see the connection and webpage printout! 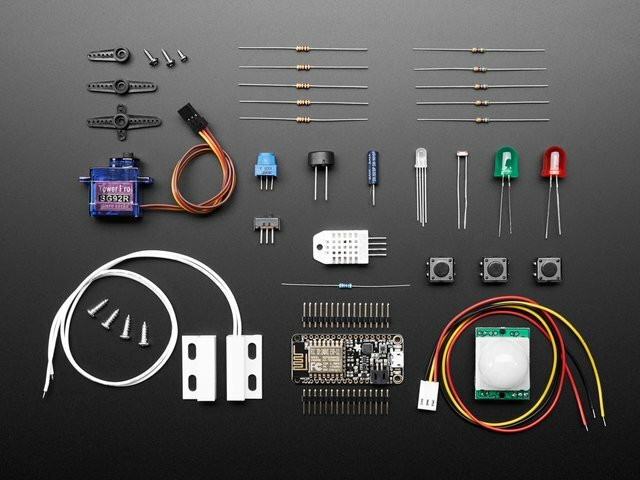 This page was just to get you started and test out your module. For more information, check out the ESP8266 port github repository for much more up-to-date documentation! This guide was first published on Apr 24, 2015. It was last updated on Apr 24, 2015. This page (Using Arduino IDE) was last updated on Apr 24, 2019.